Our Journey of Faith is now on sale. Ministers, teachers, and other students of the Bible around the world have profited from the insights and teachings of Evangelist John G. Hall. His writing are widely consulted resources on the subjects of Dispensations and Bible Prophecies encompassing God's eternal program for man. 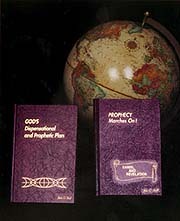 God's dispensationsal and prophetic plan is explained in Hall's writings with unique simplicity and clarity. These books have been highly recommended by denominational leaders, college and seminary presidents, as well as professors in classrooms of higher learning. Because they are clearly written and well-organized, professors in several Bible colleges have used them as textbooks and/or additional source material for courses on Bible prophecy. Tho books are approved and made available in colleges and churches of various denominations, as well as in a number of other countries. The author gives hundreds of references for proof and for futher study. Now you can explore this storehouse of knowledge contained in Prophecy Marches On! and God's Dispensational and Prophetic Plan. This enlarged edition includes additional material not found in the earlier printings. Here the author presents the study of dispensations as a natural and logical framework for understanding the past and what is yet to come in God's eternal plan. Originally offered in two separate volumes, this series has remained in demand from the time it was first published. In this new and enlarged edition, the author has combined and coordinated the studies on Daniel and Revelations, relating them also to Ezekiel's prophecies of the end times. Since the studies complement and shed light on each other, the reader will find it most convenient to have them in a single volume. Additional material, as well as a handy index enhance the value of Prophecy Marches On!